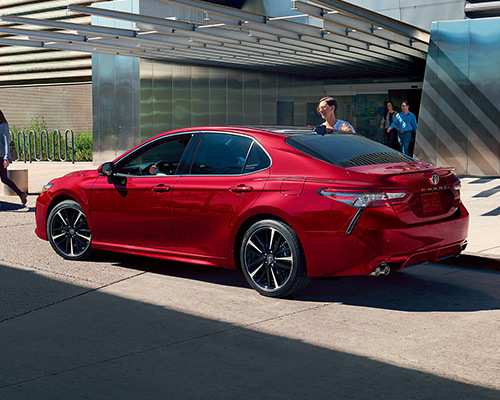 With the all-new Camry, Toyota has taken America’s top-rated most popular car and made it lower, wider, and longer for the most aggressive look this midsize vehicle has ever showcased and retooled the motor for an impressively fun car to cruise about in. 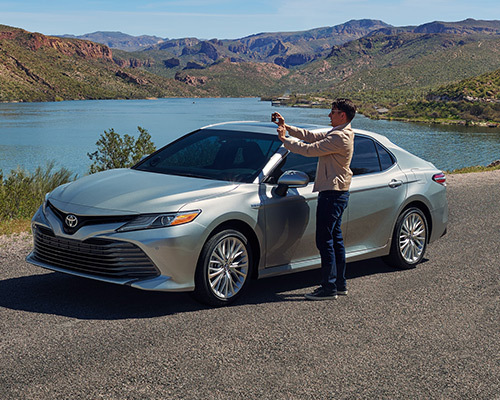 Still rock-solid with regard to reliability and toughness, the latest Camry has a fresh design and enhancements that put even more pressure on competing automakers to attempt to dethrone its eighth-generation models. Drive up in a dazzling, attention-catching manner with the flowing curves, chiseled form, and sleek lines of Camry. There are numerous ways to individualize the external appearance and interior, so buying or leasing the ideal Camry for your everyday routine is fun at Bill Dube Toyota. To help you take off on the right foot on this front, start by digging into the Camry categories we have showcased down below. Feel the force of 203 horsepower (hp) generated through a 2.5-liter (L) Dynamic Force four-cylinder engine or 301 hp produced by the more impressive 3.5-L V6 in the redesigned Camry. Both harness the D-4S direct-injection setup for optimum cruising predicated on your specific circumstances, all while autonomous strut-front suspension with double-wishbone rear suspension heightens handling for silky trips within Dover and across the country. When you are in this automobile, all passengers have the means to connect their smart device (limit of five) through optional Wi-Fi Connect and remotely charge a smartphone back up to full capacity by way of the Qi-compatible charging feature. Other driver-centric upgrades available consist of the eight-inch (in.) multimedia display with Entune 3.0 system, a seven-in. Multi-Information Display (MID), and a 10-in. Head-Up Display (HUD) that shows info directly on your windshield. By having these remarkable digital features in your corner, dazzling your friends and making the most of your day-to-day drives around Dover becomes a cinch. 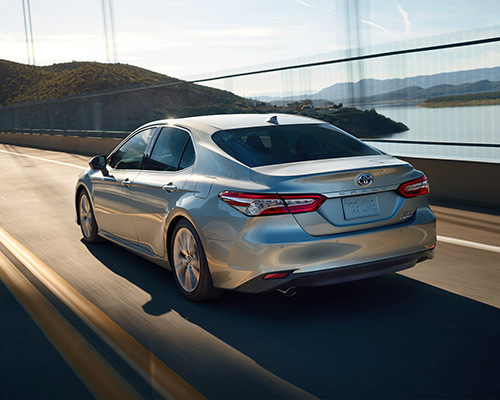 Including eight-way changeable seating for the driver and front passenger, a power-tilt moonroof featuring a large glass roof, and an opulent steering wheel trimmed in leather, the Camry L lineup has no shortage of additional creature comforts for you to take advantage of. Also, improve the stereo and navigation capabilities of your L, LE, XLE, or XLE V6 when you choose plans for audio and navigation systems. If you genuinely want your car to draw attention, then the SE, XSE, or XSE V6’s unique, catamaran-emulated accoutrements, glossy black grille up front with a sport mesh inset, and complementary black alloy wheels should be in your wheelhouse. Select the color-contrasting Midnight Black Metallic roof, side mirror, and rear spoiler for extra panache and presence. Trying to decrease your gas costs and aid in saving the planet? Attain elevated gas conservation by owning the Hybrid LE, Hybrid SE, or Hybrid XLE, all of which grant you as much as an EPA-calculated 53 miles per gallon (mpg) on the freeway. Performance is improved, as well, by way of a combination of the Dynamic Force Engine designed by Toyota and this organization's proven electric motor. In addition, you stay in absolute control via the three traveling modes — Normal, ECO, and Sport — configurable by simply the push of a button. This level of control paired with up to 41 mpg arms you with the perfect mixture of functionality and fuel efficiency. For individuals in Dover who value being eco-friendly just as much as they do enjoying luxury amenities, it is hard to come up short with this sort of fuel economy and control on tap. Camry drivers in the Dover NH region will never again have to face down not being able to locate their automobile in a congested parking lot. Make use of the groundbreaking Remote Connect to monitor your Camry if you allow another person behind the wheel or to locate it in a packed parking lot. For our friends here in Dover who dread wandering about the parking lot fruitlessly as you seek out your car, possessing this sort of cutting-edge functionality at your disposal can definitely be a lifesaver. Bill Dube Toyota's range of Camrys are just as able to wow even the pickiest of vehicle shoppers on the inside as they are from the outside. To really hammer this concept home, all you must do is take a peek at the Camry's remodeled optional eight-way powered seats (which feature leather trim), ventilated back seats, spacious leg room, and countless other premium enhancements located in this sedan. Once you put this all together, it becomes clear to understand that including even more luxury into your daily travels about Dover necessitates parking a dazzling new Toyota Camry from Bill Dube Toyota in your driveway. Feel more secure inside the most recent Camry that was given a total safety rating of five stars from the NHTSA and possesses 10 standard air bags. The well-being of you and your family is fortified through available cutting-edge highlights, including Blind Spot Monitor (BSM) that alerts you if an automobile shows up in any of your blind spots, cameras mounted on the front, side, and rear for a bird’s-eye view, and Intelligent Clearance Sonar (ICS) to make you conscious of nearby cars and pedestrians. Additionally, you can lock and unlock the front doors quickly and push a button to start up the engine with the help of the available Smart Key System. It is no big secret as to why Camry continues to be America’s best-selling car with Toyota’s most recent design upgrades, including plenty of safety measures, greater gas economy, and modern tech features. The anticipation to purchase or lease a personalized Camry of your own has presumably risen at this point, so drop by Bill Dube Toyota in Dover NH to take one for a spin yourself today.